(steps forward)The weather warmed up to almost 50 degrees one day. (steps backward)The temperature was way too close to zero this morning. Like only 4 degrees off. (steps forward) The snow piles abated quite a bit due to the warmer few days and some sunshine. (steps backward) It snowed again the other night and added another inch or two to the piles. (steps forward) I ran 6 miles last Saturday, and have my first race of the season this Saturday. (steps backward) I have not run yet today...all that cold and snow. Must be beautiful in Vermont this time of year...all that snow. (steps forward) I started my She Plans Dinner test run this week. I have had almost 10 people sign up-including myself and my husband. (steps backward) It is taking me HOURS to figure out little things-like emails lists and coupons and prices. (steps forward) At least I am figuring some of them out! (steps backward) I don't there is any. Unless you count the many hiccups still to be gotten through. (steps forward) I tried a new, easy pork chop recipe this week. Which everyone loved. (steps backward) I tried a cole slaw recipe which no one seemed terribly thrilled about. (steps forward) God is changing me. He is refining me. Things are good. (steps backward) I am still a human. I still fail. I still need grace. And I still have to work at the situations in my life-no resting on laurels. (steps forward) I read well over 100 pages in my Elizabeth of York book. (steps backward) That 100 pages still placed me at 150 pages unread when I had to return said library book. I guess I will have to check it out again. (steps forward) Saying hello to the old faithful triumvirate of spaghetti, french bread and lasagna. 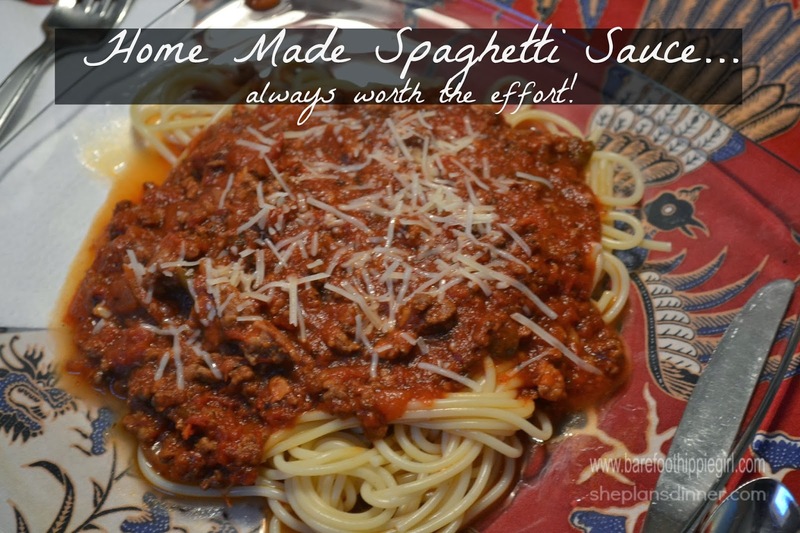 Do you make your own spaghetti sauce? I do. Because my mom always did. I remember days of her opening jars of home canned tomatoes, browning beef, and then adding the tomato sauce and paste, onions and green pepper. But the real magic was in the addition of the herbs. There was no measuring. No formula. Just a generous sprinkle of each and every one. I don't know how she gauged it, but I know her sauce we delicious every time. I love making a huge pot of sauce. In the summer I use herbs and tomatoes from my garden. In the winter I use homed canned tomatoes and dried herbs. And the tradition lives on. 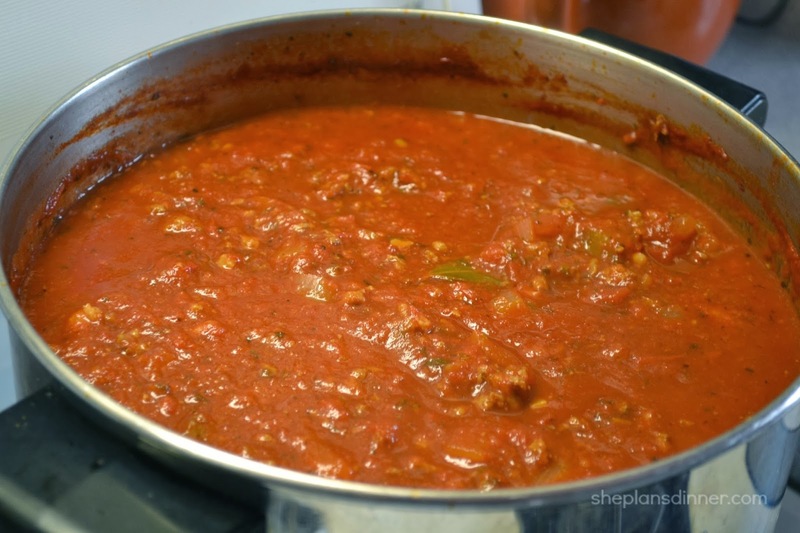 Making a huge pot of sauce takes 45 minutes of hands on time-between the chopping, browning, opening of cans and sprinkling. Then the pot cooks for hours-3 to 4, at least. But, when it is all done, I have enough sauce for spaghetti dinner a couple nights and for a pan of lasagna. And often a bonus bowl for the freezer. The convenience of spaghetti sauce is in the leftovers. Enjoy the comforting tastes and scent of this familiar dish this weekend! -Brown the meats, onion and green pepper in the olive oil. Add garlic for the last minute or so. Drain the grease. Combine the remaining ingredients. Bring to a boil and simmer for 3-4 hours, longer is better. -30 minutes before dinner, start water to boil for 1 pound spaghetti (4-6 people, use more or less as needed). When the water boils, add 1 teaspoon salt and pasta. Cook until done. 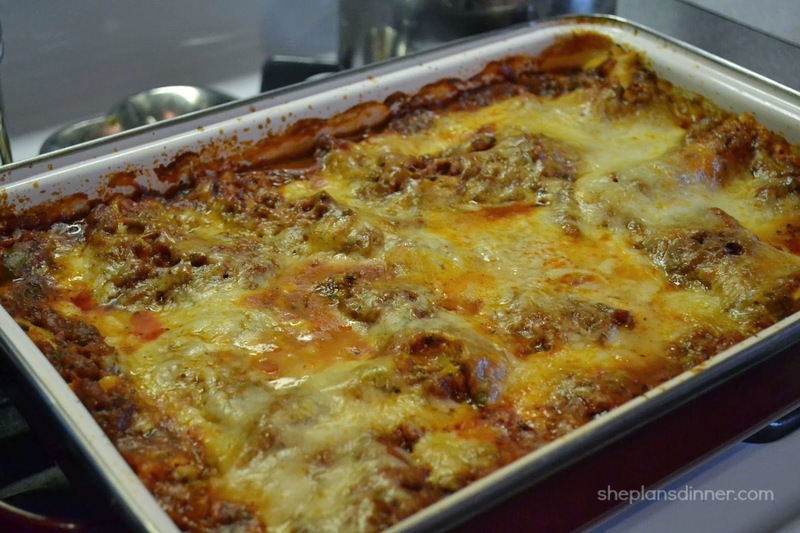 -Set aside 8 cups of sauce for lasagna. -Any leftover sauce (besides 8 cups) freezes very well. -Mix egg, cottage cheese and pepper to taste. -Layer 2 cups sauce then top with 2 cups mozzarella. -Layer 2 cups sauce then top with cottage cheese mixture. -Layer with 2 cups sauce, parmesan cheese and 2 cups mozzarella. -Pour 1 cup water around the edge of the pan. -Cover with foil, and bake for 50 minutes at 375 degrees. Bake another 10 minutes or until cheese is golden and noodles are tender. Enjoy your last official weekend of winter for this year!!!! That's not a step forward, that's a giant leap for mankind!